← The Cross Is the Key to Understanding Life by Fr. Richard Tomasek S.J. Why is St. Gertrude So Great? I got to know Gertrude of Hefta a few years ago because I was searching for someone who could help me recognize heaven more while I am on earth. Of course, recognizing heaven while we live on earth is the whole point of Christianity but Gertrude had a very graphic way of describing her experiences with God and reading her accounts heightened my awareness of being with God everyday, which is what heaven is after all. Through her writings, Gertrude also anticipated devotion to the Sacred Heart of Jesus which wasn’t popularized until three centuries later by St. Margaret Mary. By these teachings and many many others, Gertrude plainly communicates how God “has made himself known”, as the Pope says, to her. In so doing, this remarkable woman who died in 1302, has made heaven, God’s presence, more known to me in the 21st century too. 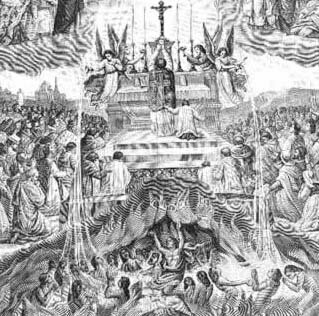 What a wonderful consolation to realize that, when I receive Communion worthily, I am able to share that joy not only with the people in purgatory but also with loved ones who live in heaven now! Truly uniting us now in Christ’s Body as, hopefully, we will all be when this world-that-is-passing-away ends. No wonder Gertrude the Great is on the short list of review to be declared a Doctor of the Church. Let’s ask for her help to grow in our faith on her feast day, November 16. 1 Response to Why is St. Gertrude So Great?